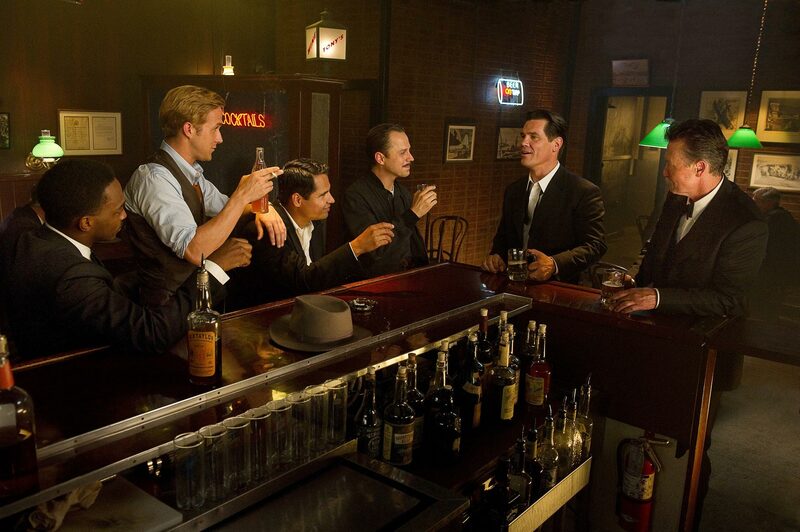 It is 1949 and Mickey Cohen (Sean Penn) is on a mission to control all the organised crime in Los Angeles. Detective Sergeant John “Sarge” O’Mara (Josh Brolin) of the Los Angeles Police Department ruffles Mickey’s feathers up by saving a young woman from some of Cohen’s thugs. Earning the reputation of ballsy and unafraid, Chief Bill Parker (Nick Nolte) puts O’Mara in charge of waging war against Cohen, any means necessary. O’Mara has special operations training and what not from World War II and would be perfect. O’Mara graciously accepts the offer to take Cohen down using guerrilla warfare tactics, and sets about putting together a task force. Parker makes it clear that the LAPD will be in no which way involved with whatever the outcome of the operation is – they are to operate under total anonymity. Sergeant Jerry Wooters is an immoral detective with the LAPD. His ideals for the task force have long since been thrown out the window. One night at a restaurant he meets Grace Faraday (Emma Stone), and is in love. His childhood friend Jack Whalen (Sullivan Stapleton) warns him to stay away from Grace, she is Cohen’s girl. Whalen is also in with Cohen to some degree, on the other hand he is an informant. Jerry and Grace start up a very hush hush relationship with one another, both keeping it from Cohen. O’Mara and his wife Connie (Mireille Enos) discuss his new task, and she reminds him that she is pregnant and that he has a family to provide for. Thereafter she helps him assemble the team he will use, ones that will most likely not be on Cohen’s payroll. So O’Mara recruits Conway Keeler (Giovanni Ribisi), a family man, Coleman Harris (Anthony Mackie), an anti-herion black cop who is intent on making a difference and sharpshooter Max Kennard (Robert Patrick), who comes part and parcel with his Hispanic partner Navidad “Christmas” Ramirez (Michael Peña). O’Mara fails miserably when trying to bring in Jerry, who is content on doing absolutely nothing at work. Now that the task force is formed, they start knocking over Cohen’s businesses, starting with an illegal casino. Instead they get busted and locked up, and before anything can happen, their luck takes a turn. Jerry joins the gang when a young kid named Pete (Austin Abrams), who polished shoes, is murdered when Jack Dragna (Jon Polito) is almost assassinated. Embittered, he goes in to murder Cohen, and Whalen stops him just in time. 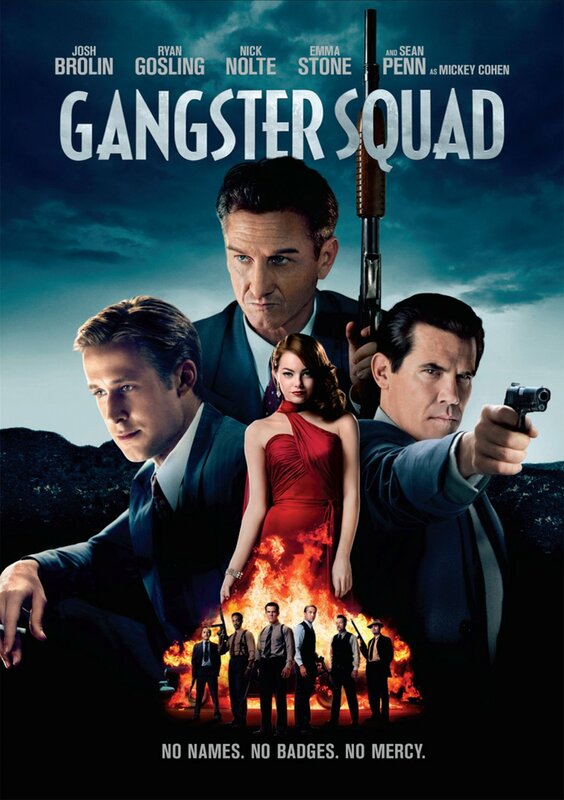 He breaks some of the guys out of prison, and soon the squad starts cracking down like a whip on Cohen’s activities, causing major issues and just becoming a real pain in the gangster’s side. So far the group has remained anonymous, and by a stroke of luck Keeler manages to plant a bug in Cohen’s home, giving the squad an even better insight to the inner workings of Cohen and his people. Cohen’s organisation is suffering, and he is getting angry. Will he work out that it is a bunch of cops that are bleeding him dry, causing him grief? Will he work out that Grace is in love with another man, one of the men that are causing him untold amounts of trouble? Will Cohen ever get to run Los Angeles completely, as he hopes to, even though he is sustaining serious knocks in business? 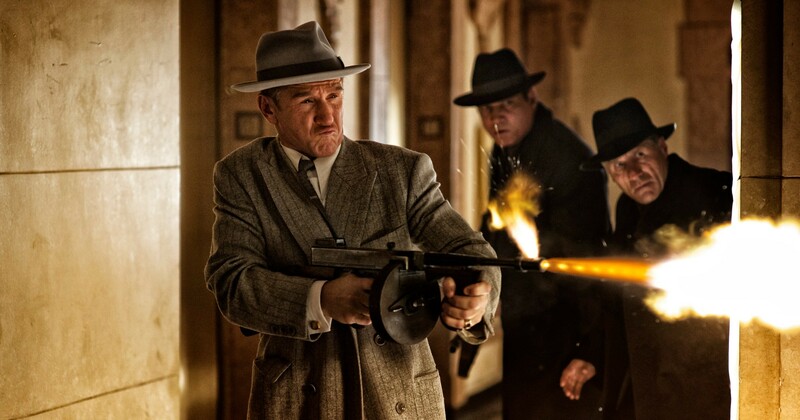 Will the Gangster Squad bring Mickey Cohen to his criminal knees? I am going to score this a 6.5/10. I had a hell of a lot of fun with this film. It was serious at parts, and then it was balls-to-the-wall fun at other times. There was humour, there was drama, there was a love story and there was tons of action. This is not a film to take too seriously, and I liked the fact that the movie never tried to be that too much. Some people wanted it to be more, but it is nothing but an entertaining piece of film. It benefited from a really good cast and a decent script, though the dialogue was pretty damn questionable at times, it remained entertaining throughout. I didn’t know what to expect at all from this film when I went in for it seeing as I had tried to keep my knowledge on it at an absolute minimum so that I could have no expectations (I try really hard to do that), and had a colleague strongly recommend this for me, and I must say it was pleasurable. There were flaws, there were mistakes, but overall not enough to detract from the movie (unless you want something very serious and historically very accurate). Emma Stone was simply gorgeous as always, and Brolin, Penn, Patrick, Mackie, Ribisi and Gosling really worked well together, definitely giving you something to smile about. 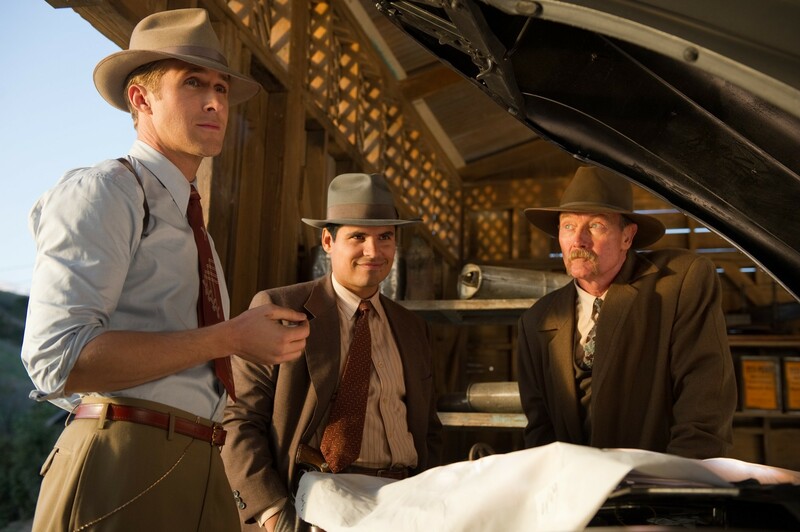 The Gangster Squad itself was endlessly entertaining to watch, too, and I thought this was done rather well, and I enjoyed the costume design. A light film, not the greatest of all time, but perfect to put in for the simpler things in life, not too demanding. This entry was posted in Movies and tagged Anthony Mackie, Emma Stone, Gangsger Squad, Giovanni Ribisi, Josh Brolin, Mickey Cohen, movie reviews, movies, Nick Nolte, Robert Patrick, Ryan Gosling. Bookmark the permalink. What a shame this turned out to be…stellar cast, catchy trailer, and they had nothing. This is one of the biggest busts I’ve ever witnessed. Excellent post, Zoe! Happy you had some fun with this one :). Zoe! Why is reading so hard to get done!!?!! I did have fun with it, probably because there was no marketing here and no hype and I had no expectation of historical accuracy, etc! Though I can see why people would be let down, it is just mindless fun! Oh Joseph! It really can be issues! I hope that you are making some progress though? I was wondering what our next stint would be, then figured I will wait for you to get through one of them first at least! I couldn’t agree more Joseph, one of the worst movies I saw last year. This movie will be for some and not for others. Great review Zoe! I agree with you Zoe, I quite liked this. I thought the look of it was really funky. You hit the nail on the head when you said it is a film not to be taken too seriously. That is the key. Great review. Thanks a lot Tim, glad to see I was not the only one that had fun with this! Nice to see you enjoyed yourself with Gangster Squad, I really can’t argue with your points here. It isn’t intended to be taken too seriously, but I guess at the time I watched this I didn’t really have that insight, so I took it quite literally and thought it to be terrible! Lol. You noted too that the script wasn’t good, but whereas you were able to get over that easily I wasn’t. Damn me and my high expectations. . .
Teehee, sometimes it is just worth it not to know anything about something and go in blind! It sure worked for me here! You know, I took that bad dialogue as cheese, and every now and then a cheesy movie is a lot of fun! He was having a total blast with his role! I loved this film, wasn’t sure of Gosling’s squeaky voice, but loved his character none the less. It was very violent though so I’d struggle to watch it again for a while. Thanks! Glad to hear you also had fun with it! Ah, his voice didn’t bother me, though it was a little different from his usual self. Great review! I didn’t catch this one and I’ve heard a lot of people were disappointed with it. I might give it a whirl if it’s on TV though. The cast are pretty good after all! Thanks Chris! It is a really fun watch, just don’t go expecting some heavy drama or historical accuracy and what not! The cast was very good! I meant to see this when it came out and then I missed it. Sounds like it was a good laugh. It was, in terms of entertainment and a dash of cheese, this was the way to go! Good read!! I don’t really have any desire to see this though… good work!! Yeah don’t reckon it’s your cup of tea but it is fun! Ugh! I have this on my DVR but I can’t bring myself to watch it. I was originally looking forward to it but all of the bad reviews and the opening 15 minutes have pushed me away. Really good review. Yeah I always thought of it as a 6/10 film. It’s a fair score I reckon. Nothing great, nothing awful. Yeah, this one sure is dumb. But you know what? I didn’t mind that because it was clearly having fun with itself and asked us to join in on it as well. For better, and for worse. Good review Zoe. 😀 YAY! For both, it was exactly what it was and it was a good ride (for me, at any rate). Thanks Dan! Yeah seems this was very unpopular with a lot of people! Still haven’t caught this and am in no real hurry to do so if I’m honest. That being said, great review Zoe! Thanks a lot! Yeah you don’t need to rush out for it, but you don’t need to turn it off if it comes on TV, either! Ah pity to hear, though it seems a lot of people weren’t very interested! I would like to know what you think. I didn’t think it was as awful as it was painted, just don’t expect a historical account of Mickey Cohen and what not haha!